After nearly 12 years, Contessa Nyree decided she had enough of being a lawyer in Manhattan. Mentally and physically exhausted by the job, Nyree saved up enough money to temporarily walk away from both the working world and New York — with enough in her bank account for an adventure or two. Nyree eventually moved out of her 400-square-foot apartment, sold her furniture, packed all of her remaining belongings in an 8-by-10-foot storage unit and hit the road with two suitcases. Her destination? Every track — and almost every race — on the NASCAR Cup Series circuit in 2018. With the exception of the fall Richmond race (which she skipped to attend her godson’s baptism in Wisconsin), Nyree attended 37 Cup Series events this season — as well as the companion Xfinity/Truck Series races at those tracks and the Eldora Truck race. She did it all on her own dime, receiving no freebies, discounts or extras from NASCAR or any of the tracks. Nyree drove to the majority of the races in a used 2015 Toyota Prius she purchased after leaving New York (there’s no reason to own a car in the city, after all). She estimates between the Prius and the cars she rented on the few trips that required flights, she drove approximately 40,000 miles. There were times when she questioned herself, as well as some long and lonely days on the road. She spent her 40th birthday in September flying from Indianapolis to Las Vegas for the first playoff race. There were also a few headaches along the way, like when a few tracks sent tickets to her brother’s home in Wisconsin — currently her legal address — instead of leaving them at will call. But for the most part, the trip went smoothly. Though she’s been a fan since 2005 — she cheered for Tony Stewart until his retirement, when she became a fan of Wood Brothers Racing — Nyree said she’ll remember much more than just the races themselves. “When I think back to any race weekend, it’s the random race fans you sit and talk with,” she said. “As fans, we all sit down and talk to each other — whoever is next to you to eat or in the stands. And you might not get their name or see them again, but you can talk racing. Her tips for fans include staying 45-60 minutes from the track (she said most of her hotels this season were under $150 per night) and looking for deals on the track’s websites (she would purchase her tickets anywhere from two months to two weeks out from the race). So what’s next? Nyree is not sure what 2019 holds, but she has one more stop on her NASCAR tour before the year ends: Champions Week in Las Vegas. Race fans do weird things sometimes just to be part of what they love. Going to them all, except 1 to be with family is amazing. I did 11 Cup races, 8 Xfinity, and 7 Truck races in 2017. Between those races and dirt racing last season I attended 61 races. This season I could not keep up that pace, lol, as I went only went to 8 Cup races, 5 Xfinity races, and 3 Truck races and a total of 43 races. I am in a blessed position, but I promise I’m not making incredible amounts of money more than people. If you want to go to a few races a year it’s VERY doable for most people. For a family, 1 is still do-able for most. Folks that use cost as an excuse it just that, making excuses. Nothing, nothing, beats being at the track and it changes how you look at the sport as a whole. If you want to go to a race, do your research, find the deals and don’t be afraid of travel and adventure. I paid for my roval ticket this year by using to survey apps…Surveys on the Go and Google Opinion Rewards. I made about $100 in a year for a few hours of my time and bought my ticket and food so going to a race is doable for anyone. All I can say is wow, how incredible AND brave. This is my dream if I suddenly win the lottery. Take a year off, get a RV and travel the circuit for a year. I so envy you gf! That’s always been my dream to be able to do what you did. What awesome memories….been to a few races and being there at the track is an incredible experience! Good luck in your future endeavors!!! I had the honor of meeting Contesda at the Sears Point Teeet-up and hopefully I renew the aquaintence at Sunday’s Tweet-up in Homestead!. I always say if I ever win the lottery that is exactly what I would do. Follow the NASCAR circuit from start to finish. I would buy a motor coach and drive from track to track. I don’t think I could ever afford it other then winning the lottery……so I will keep dreaming and maybe one day it will happen!! Good for you!???????????????????? WOW. That’s all I can say is WOW. You have had an awesome trip and you are so brave to weather the weather on you trip. The memerys will last a lifetime. 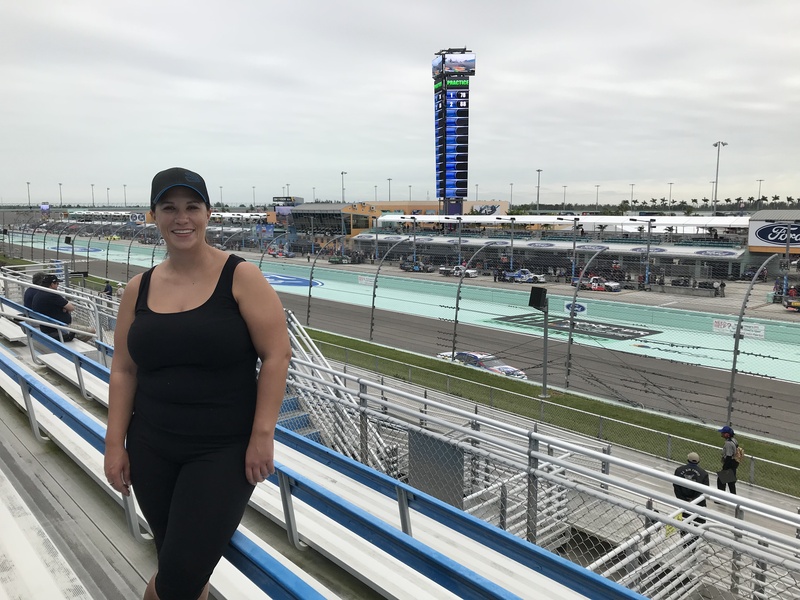 What a dream vacatiion, to travel and attend the 2018 NASCAR Cup Series circuit races! Not just WOW, but HOLY COW!!! Did you travel alone or did you have others tag along at times? Love the travel tips you shared about where to stay and what else to take in along your journey. As a U.S. Army Retiree (Post 9-11 Wounded Warrior, I served from 1987-2007) that loves EVERYTHING NASCAR, I now have an entirely new “Bucket List”! I would really love to take my wife on an extended vacation, but didn’t know where or how. I’m curious to know if NASCAR offers any discounts for 100% Disabled Veterans that want to do this very thing? I’m proud to see your love for NASCAR and your successful travels! Godspeed and great luck in your future travels! Thank You for your service Sean ??????? ?